Deadline to apply is June 22, 2017, but we encourage earlier submissions. The International Center on Nonviolent Conflict welcomes the submission of presentation proposals for our Webinar Series on Civil Resistance* for Fall 2017 and Winter 2018. 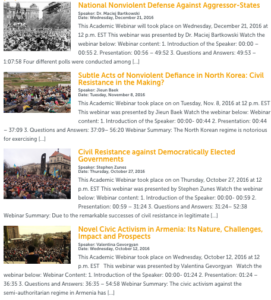 ICNC’s Webinars are a series of online talks and interactive discussions combined with individual or group presentations on critical ideas, cases, and questions related to civil resistance and nonviolent movements. Webinars are streamed live and the recordings are posted on ICNC’s website for future viewing. We particularly encourage the submission of webinar proposals that explore relatively under-discussed or under-researched topics on civil resistance and nonviolent movements and that bring an analysis and perspectives on nonviolent conflict informed directly by the field experience and/or voices of practitioners. ICNC is interested in presentations that directly discuss ideas of civil resistance practice and scholarship. ICNC offers a modest honorarium to webinar presenters that ranges between $200 to $400, depending on the number of presenters in a webinar and speakers’ experience. Our Webinars are intended for scholars, activists, educators, members of the media, policy makers, practitioners, and students. Since the series began in 2010 we have reached thousands of participants from around the world. Civil resistance is understood as a nonviolent struggle that civilians undertake using a range of nonviolent methods — including, but not limited to, marches, strikes, boycotts, noncooperation, civil disobedience, building alternative institutions — with the aim of winning human rights, establishing greater accountability, social justice, and more inclusive, nonviolent democratic spaces. Prospective applicants are encouraged to review past ICNC Webinar recordings and the list of topics that are of interest to ICNC. View full ICNC Webinar Digest with webinars delivered between 2010-2016 and check the website that list recordings of the past webinars up to May 2017.